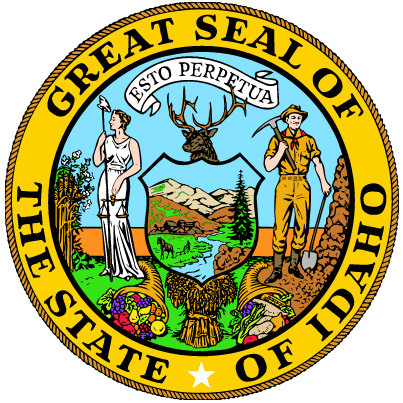 Seal of Idaho; public domain image on Wikipedia. "Before designing the seal, I was careful to make a thorough study of the resources and future possibilities of the State. I invited the advice and counsel of every member of the Legislature and other citizens qualified to help in creating a Seal of State that really represented Idaho at that time. Idaho had been admitted into the Union on July 3rd, 1890. The first state Legislature met in Boise on December 8, 1890, and on March 14th, 1891, adopted my design for the Great Seal of the State of Idaho. The question of Woman Suffrage was being agitated somewhat, and as leading men and politicians agreed that Idaho would eventually give women the right to vote, and as mining was the chief industry, and the mining man the largest financial factor of the state at that time, I made the figure of the man the most prominent in the design, while that of the woman, signifying justice, as noted by the scales; liberty, as denoted by the liberty cap on the end of the spear, and equality with man as denoted by her position at his side, also signifies freedom. The pick and shovel held by the miner, and the ledge of rock beside which he stands, as well as the pieces of ore scattered about his feet, all indicate the chief occupation of the State. The stamp mill in the distance, which you can see by using a magnifying glass, is also typical of the mining interest of Idaho. The shield between the man and woman is emblematic of the protection they unite in giving the state. The large fir or pine tree in the foreground in the shield refers to Idaho's immense timber interests. The husbandman plowing on the left side of the shield, together with the sheaf of grain beneath the shield, are emblematic of Idaho's agricultural resources, while the cornucopias, or horns of plenty, refer to the horticultural. Idaho has a game law, which protects the elk and moose. The elk's head, therefore, rises above the shield. The state flower, the wild Syringa or Mock Orange, grows at the woman's feet, while the ripened wheat grows as high as her shoulder. The star signifies a new light in the galaxy of states. . . . The river depicted in the shield is our mighty Snake or Shoshone River, a stream of great majesty. In regard to the coloring of the emblems used in the making of the Great Seal of the State of Idaho, my principal desire was to use such colors as would typify pure Americanism and the history of the State. As Idaho was a virgin state, I robed my goddess in white and made the liberty cap on the end of the spear the same color. In representing the miner, I gave him the garb of the period suggested by such mining authorities as former United States Senator George Shoup, of Idaho, former Governor Norman B. Willey if Idaho, former Governor James H. Hawley of Idaho, and other mining men and early residents of the state who knew intimately the usual garb of the miner. Almost unanimously they said, "Do not put the miner in a red shirt." "Make the shirt a grayish brown," said Captain J.J. Wells, chairman of the Seal Committee. The "Light of the Mountains" is typified by the rosy glow which precedes the sunrise."